Helllo Rainbows :3 Know some of you just started your new semester and I'm here to say GOOD LUCK for those who sitting for SPM examination this Wednesday. Best of luck & All the best for you. Believe it or not if you believe in yourself, you can definitely score it well. Remember to have enough sleep before you sit for your exam. Flashback (fews years back) I always sleep at 10pm and wake up at 4am then, start to do some revision before I go for any examination because during that few hours (10pm-3am) is our body organ best resting time. But some of you might not feeling good when wake up too early so you need to find your own best time to do your revision every time before your exam. Again, GOOD LUCK! Back to the main topic , today I'm going to update something which relate to my recent life. With the help of both mascara and eyeliner we can simply create a simple makeup look FOR SCHOOL. It's very useless for me to teach you how to make up with this two simple step but what I need to emphasize is picking the right product for yourself instead of wasting your time to do your makeup by applying more than 5++ makeup product. As usual apply your daily skin care routine + sunblock product. Then, get ready with the easy apply eyeliner and also a super useful mascara. 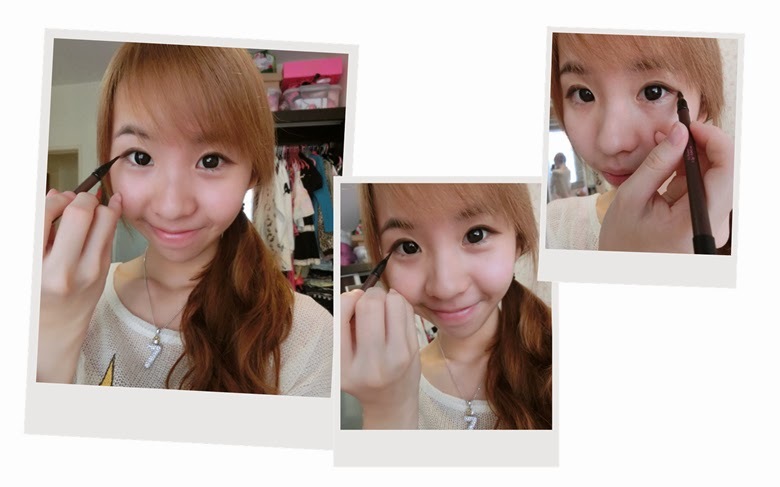 I'm using Sasatinnie Smokey Eyeliner Pen & Party Queen 4D Hot Lash Mascara to complete my look. Let's Get Started with their smokey eyeliner pen which you can easily get at any Sasa Outlets too. First of all I should be glad that I got the chance to try this smokey eyeliner pen and it's also known as eyeshadow liner pen. This kind of eyeliner can basically create an eyeliner or smokey eye look with just a simple PENCIL but you need to have extra step on it to blend out the smokey eyeliner lah! I have diff kind of eyeshadow liner and smokey eyeliner but this one is slightly special with the design of the brush at the end of the pencil. Not to mention what brand but you know those previous eyeliner I got they're not design with a brush behind to blend it out. The texture is something like sponge. AM I right? I found it somehow difficult for beginner with that and when I'm rushing for my class I don't even deal with the pen. I just draw the simple eyeliner but after I blend with the sponge behind the pencil the area it blend suddenly out of it and it make my makeup look super heavy + I need to use cotton pad to remove it and apply it again with a sharp line and slightly blended eyeshadow on my eyelid. It's so annoying and I would like to have a small sponge or an additional brush to blend it so that it wont out of the area I want. Luckily I found this because this eyeliner pen have an additional tiny blush at the side then you can blend it easily as well. I picked myself a Black color and a brown color from Sasa. The pencil just same as others it's very easy to apply but this brown color is slightly natural than others color after I blend it out. So let me show you the before & after photo. Go to class no need thick heavy makeup so an easy and natural look is enough for us. If you don't wish to have black eyeliner you can actually change to brown color so it make your eye makeup look softer and more natural with it. Or for those who have brown color hair you can use brown eyeliner too and recently I got all my eyeliner with brown color 1. Hehe :) As you can see my eye look brighter and enlarge the size with just a simple step added on my eyelid. See the texture of the smokey eyeliner it's super soft after you blend it out on your eyelid and you no need to worry if it's out of your area because you can simply wipes it off. Because it's softer after you blend it + it's easy to wipes off the eyeliner actually easily gone and become super smudge (dirty eye look) if you didn't blend it well. Make sure you blend it and extend the line with the brush ya! But other than that I think this works pretty simple for beginner and I know some of you don't know how to draw a proper eyeliner and afraid get a dirty eye.. Guess you can try this out :) Plus,the intense color is super weightless and glides with utmost east and feather soft touch and if you wanna to get a smokey eye look I think this works super well on everyone because seriously the texture is super smooth and luminous. Next I'm using Sasatinnie Part Queen Hot Lash Mascara. This can create a very dramatic curly eyelashes especially (see the photo above) the lower eyelashes become like this after using this mascara. I love the outer look of this product because the cap of the mascara look super cute with the ribbon opening cap. In addition, the special non-clumping brush is designed to separate , life and thicken your lashes in just a few second. Even your lower eyelashes can result in such a good outcome , it look like applied a false eyelashes on my lower eyelashes. Super recommended for those who wishes to achieve dramatic japanese lower eyelashes. I apply this as a last step after my eyeshadow or eyeliner. Simply apply first coat for a natural look and for those who want to have more volume you can wiggle the brush back and forth at the base lashes, then sweep up & out. Love this mascara because my eyelashes without clumps!